Electrical power generation is critical for modern life. If your house draws too much current then the fuse will blow. Exactly the same logic applies for the whole UK each day to meet peak energy demand. Without power for the water supply, sewage treatment , transport, security and healthcare, banking and commerce, society would quickly collapse. In August 2013 I began monitoring the Peak and Base electrical power generation on the National Grid Balancing Mechanism . For each 24 hour period since then, I calculate the instance of peak demand and the instance of lowest demand and monitor power output. In general the peak occurs at ~6pm each day and the trough (base) at around 3am each night. 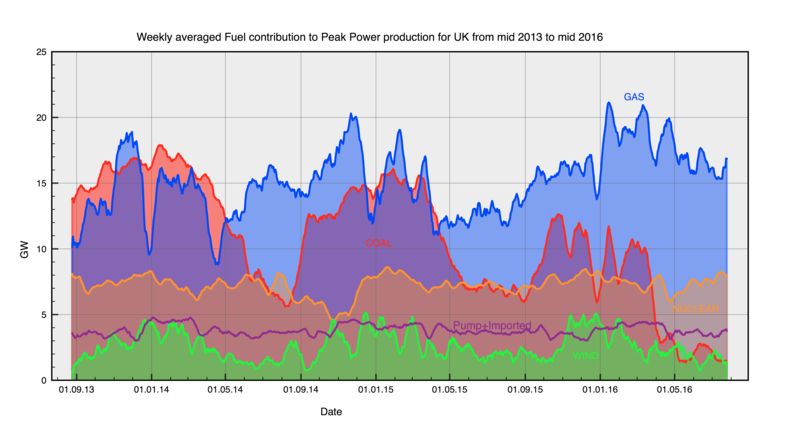 To keep the lights on the National Grid must meet the peak demand every day of the year. The lowest ‘trough’ demand represents so-called ‘base load’ or the power that must be available permanently to run UK infrastructure. Here is the overall result for all fuels averaged over each week in the 3 year period. At the beginning 2013 coal was the dominant fuel, but by 2016 gas has become far more important, as coal plants have been closed. Yet coal is still essential to meet the winter power surge, and this will surely still be the case this winter. Nuclear power is our most reliable energy source despite its age, providing about twice as much power as wind. Wind output has hardly changed over the 3 years despite enormous investments and subsidies. Note however, that the Wind values here are only for metered wind farms, and if we include smaller wind farms, which appear as drop in demand, then the power figures should be increased by about 40%. Despite this the combined imported energy from France and Holland and pumped hydro consistently outperforms wind. The detailed daily data shows how stochastic wind really is . 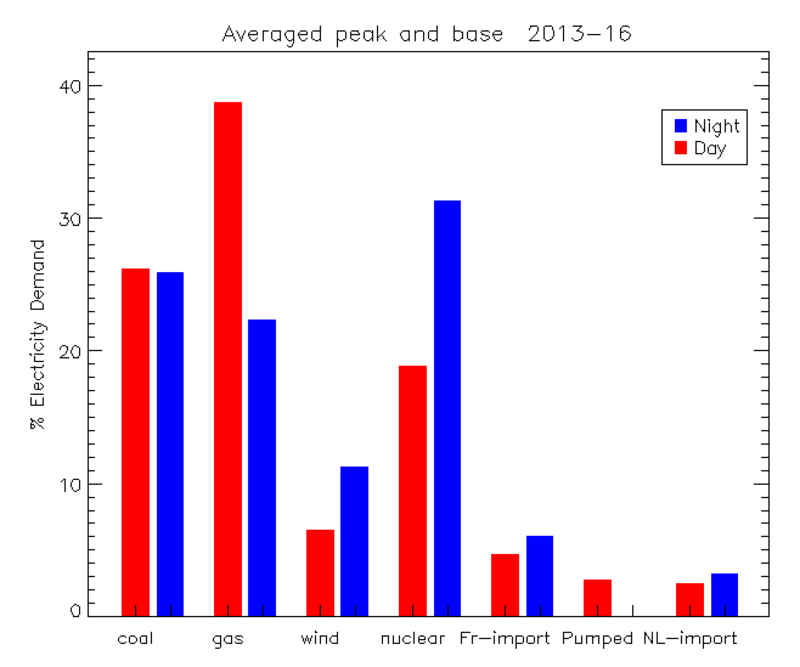 Output from power stations that met daily peak demand from 2013 to 2016. The regular oscillation in gas and coal is the weekend effect with lower demand. The Christmas periods are also evident. Gas power stations are used to balance short term demand powering down at night. Wind power is essentially stochastic peaking in output during winter months, but showing little long term increase. GAS is crucial for balancing the grid. Nuclear provides a constant base-load capacity but provides no ability to balance demand. Coal is being phased out to meet carbon targets but several ‘moth-balled’ plants will likely be needed again this winter. The priority for energy security in the short term should be to build new CCGT gas stations, because the next generation nuclear plants will not be ready in time. You can see how gas output can be switched down at night by comparing the peak and trough power demand for Gas (red,purple) and wind(green,blue). The red curve is power output from Gas at peak demand while purple is the output at night (lowest demand). The green and blue curves is the same thing for wind showing no difference. Note how gas balances wind shortfall mid 2014 and in 2016. The overall peak and base load data looks like this over the 3 year period. You can see that UK power demand has fallen slightly over the two year period. There are two reasons for this. Firstly there have been some genuine energy efficiency savings, and secondly there has been a growth in embedded generation (through feed-in tariffs). The largest category of these are waste and biofuel plants plus small wind farms. I estimate the net effect from embedded wind farms is to increase BM values by ~46%. So in other words the total power contribution from all wind farms should be multiplied by 1.46. However, since I calculate percentage contributions based on the sum of energy sources the comparison is still valid. Home Solar panels are still insignificant on this scale. The sources of UK electric power generation at Peak times (around ~5pm) and at Base times (around ~3am) from 2013 to 2016 has been measured to be as follows. In general Peak demand is ~50GW while Base demand is ~ 25GW. Detailed values from the figure are given below. Peak demand might reduce slightly in the short term with efficiency savings, but long term Energy capacity will probably have to double if plans to electrify transport and heating proceed as planned. A minimum of 0.16% of peak demand on 19th Jan 2016 (0.07 (0.1) GW ) and a minimum of 0.3% of base load on 4th October 2015 (0.06 (0.09) GW) . The figures in brackets are corrected to include embedded small wind farms. Nuclear cannot realistically be used to balance the grid. It can only provide base load and perhaps excess free energy at night. In Belgium this is used to illuminate all the country’s motorways. In the future any excess nuclear energy (and wind) at night can be used to charge electric vehicles. Gas will remain essential for balancing demand in the long term, and I don’t see any realistic alternative. To do this in the future we will need a minimum of 5 GW capacity. Wind is stochastic and unreliable and will always remain so. As much energy is generated at night as during the day. Batteries for energy storage for grid supply simply won’t work. Other forms of energy storage reduce overall power efficiency to uneconomic values. Solar energy is simply unsuitable for the UK because power production is asynchronous to demand, and the maximum average load factor is just 9%, falling to 2% in winter. I think a sensible future for the UK would be 25 GW of new Nuclear, which is about 8 times the capacity of Hinkley C and 25 GW of gas ( ensured by building 3 new CCGT gas stations) plus wind. Existing wind capacity is still not exploited properly because it needs an upgrade to power lines from Scotland to England to avoid costly capacity payments when there is too much wind. The cheapest nuclear option would be to build 8 identical proven plants such as the Westinghouse AP1000 and/or Hitachi ABWR which is already operating. This entry was posted in coal, Energy, nuclear, renewables, Science, Uncategorized, wind farms and tagged Coal, Energy, Gas, wind power. Bookmark the permalink. Clive, interesting that wind has not really gone up in the last 3 years, despite new turbines sprouting up everywhere. Why is that? Also you say that nuclear can’t provide balancing, but there’s this article at Forbes that implies that it can, at least for some types of reactor (the type that Germany is closing as part of its EnergieWahnsinn policy). I think that there is a basic infrastructure problem for wind that is being kept quiet. Many of the largest wind farms are in Scotland whereas most of the population and industry are based in England. There is a limit on transmission lines to bring power down south. I had a discussion on this with David MacKay about a year ago. He said that there were efforts to increase the capacity but basically they need at least another high power interconnector. You can see that total metered power for wind on the National grid is limited to about 6 GW. It never goes above that figure. All that happens is that they(we) pay capacitance payments of million of pounds to the producers to disconnect – because there is too much wind ! It makes no sense adding more wind farms until this basic problem is resolved. Connecting wind farms from remote places involves huge expense in transmission lines which we end up paying for in addition to the subsidies ! I also heard that nuclear stations could be used for load balancing. However I think it is better and safer to just let them run at full power. Electricity at night should be essentially free. Then we might start aluminium smelting again, or generate hydrogen from water . Same applies to wind power. They too should be paid the going rate depending on demand. Clive, my only question on this is why you include wind in the future – or are you just saying that we might as well use what is already there, without adding to it? Also, I see Matt Ridley mentioned you in the Times today. People still talk about “storage” as if it were a viable option, or at least just round the corner. Doesn’t seem like it! Basically we may as well use them since they are already there. I would stop building any new ones – especially off-shore, because they are already yet another future environmental legacy which one day will need to be cleaned up. – like 60’s tower blocks. At least someone is reading my blog ! I note that you do not consider the contribution of Solar in the UK as being worth counting at all. The 2016 EurobservER data shows that by the end of 2015 the UK had installed a nameplate value of 8.9GW of Solar PV with an output of 0.86GW resulting in a capacity value of 9.6%, the least preformant Solar in Europe. Using US EIA values for overnight capital costs my estimates show that by 2015 these solar PV installations would have had overnight capital costs for installation of about 34.3bn€ resulting in my guesstimate a total 60 year cost commitment of about 165bn€. The comparison with Gas Fired electrical generation shows that this amount of power could be produced for a capital cost of about 0.85bn€ and a comparable 60 year lifetime cost including fuel of about 6.8bn€. As David Mackay indicated in this video from the Guardian that DECC civil servants have always known that Solar in the UK was worthless, but that it was green oriented politicians that insisted that Solar was included in the UK Renewables mix. So by your assessment that solar in the UK is worthless this would mean that ~40% of the capital costs and ~37% of the likely 60 year running costs of the current UK installed weather dependent Renewables have been spent on valueless Green religious virtue signalling. Nonetheless those costs have been imposed on UK taxpayers and UK electricity users to no purpose and that sum could have purchased about 35 Gigawatts of reliable, dispatchable gas-fired generating capacity. I think there are some fundamental misunderstandings about how we use electricity. When you boil a kettle you need 1 Kw of power for 2 minutes. The energy you use is just 0.03 KWh. That is the same as 33W for one hour but is useless for making tea. A kettle can never be made to boil on demand from a solar panel on your roof, except perhaps at noon on a sunny day in July (if the panel is big enough). The power output is zero after dark and a factor 9 times smaller at midday in winter than in summer. Since demand is highest at 6pm solar energy is pretty much useless for most of the year, and in the UK the energy return barely covers the energy used in making the silicon. Solar + battery has a niche market for isolated houses, road signs and phones, but will never be a major factor for UK electricity supply. The renewables industry always quote values in energy but avoid ever discussing power. Energy produced when we don’t need it is not really worth having, because you can’t store it. In a properly functioning energy market the price per MWh would depend on the instantaneous demand. Instead we guarantee prices for stochastic sources like wind and semi-stochastic sources like solar, then cynically penalise traditional fuels with a carbon tax. Hence the claim often made that renewable ‘energy’ is somehow competitive with nuclear or coal, yet renewable ‘power’ remains essentially random. As a result the National Grid continues to depend 100% on Gas, Nuclear & Coal because they know that one cold still evening in January all 50GW will have to be met by them, because renewables regularly fail to deliver any power at all. I have been looking at the latest DUKES 2016 energy statistics document. Total Electrical Energy generated for 2015 was 360 TWh. So only that way can I get the UK ‘renewable’ energy to reach 24%. I am surprised that wave energy doesn’t represent one of the main parts of renewable energy production in UK, considering it can be very convenient due to the location. Also, how is the problem of nuclear waste solved? Do you know? I think the environment in open sea is too harsh for machinery. There have been several prototypes installed but it never really took off. Don’t forget also that waves are generated by wind. Tidal power on the other hand is generated by the changing gravitational forces of the moon and sun as the earth rotates. These are entirely predictable and with enough effort could probably add ~ 2GW to UK power needs. However, you still need a reliable and controllable high intensity power source which in the long term is some form of nuclear energy. Spent fuel is stored for a few years under water until the heat decays. Then it can be reprocessed, and the high level waste (fission products) vitrified in glass. These can be safely buried deep down in geologically stable rocks. The French do this now. You sometimes hear stories like what will our descendants do in 20,000 years time if they dig them up. Or what happens if in 100,000y the water table shifts etc. However these same people are up in arms about the danger to life from climate change in just 100y time, while ignoring the threat to birdlife and bats from wind turbines. They can’t have it both ways !